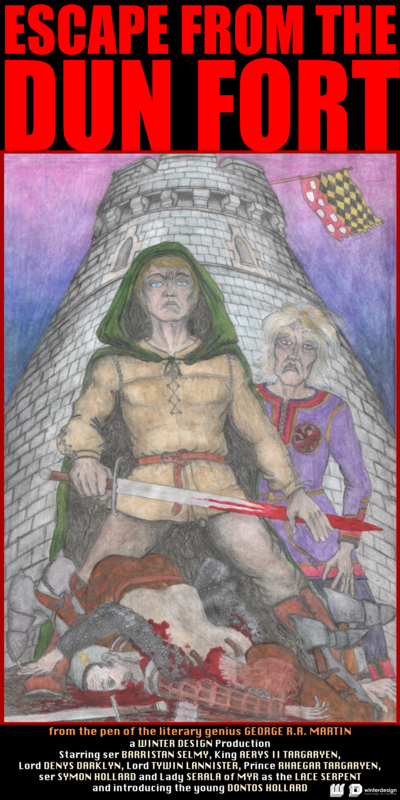 I wanted to draw a younger version of ser Barristan Selmy and it struck me his image, sword in hand, over a pile of dead bodies, the Dun Fort tower of the fortified town of Duskendale and king Aerys II at his back! Historically the events of the Defiance of Duskendale took place during the reign of king Aerys II Targaryen in 277 AC. King Aerys was imprisoned in the Dun Fort dungeons, after being captured by lord Darklyn and Denys’s master-at-arms, ser Symon Hollard. Lord Tywin Lannister was outside the castle walls with the royal army demanding the release of the king upon the menace of storming the castle and putting everyone inside to the sword. Ser Barristan asked permission to try a last minute rescue attempt, and lord Tywin conceded him 24 hours before attacking; so, the knight performed one of the most incredible of all his legendary deeds. He concealed himself under a cloack as a hooded beggar, scaled the castle walls under the cover of night, then scaled the Dun Fort walls as well, and fought his way to free king Aerys from the dungeons. While bringing the king to safety, he avenged his sworn brother, Ser Gwayne Gaunt, by slaying his killer, ser Symon Hollard, as well as other guards who tried to stop him. 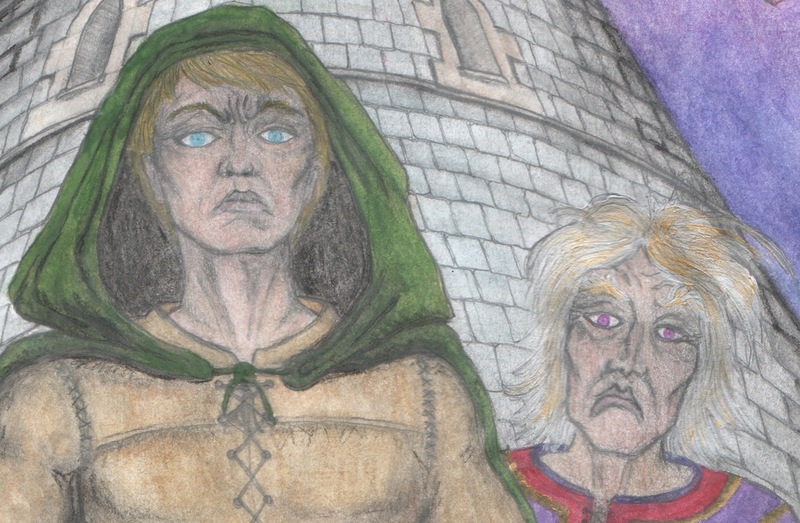 The moment he emerged from the Dun Fort tower is depicted in this drawing. 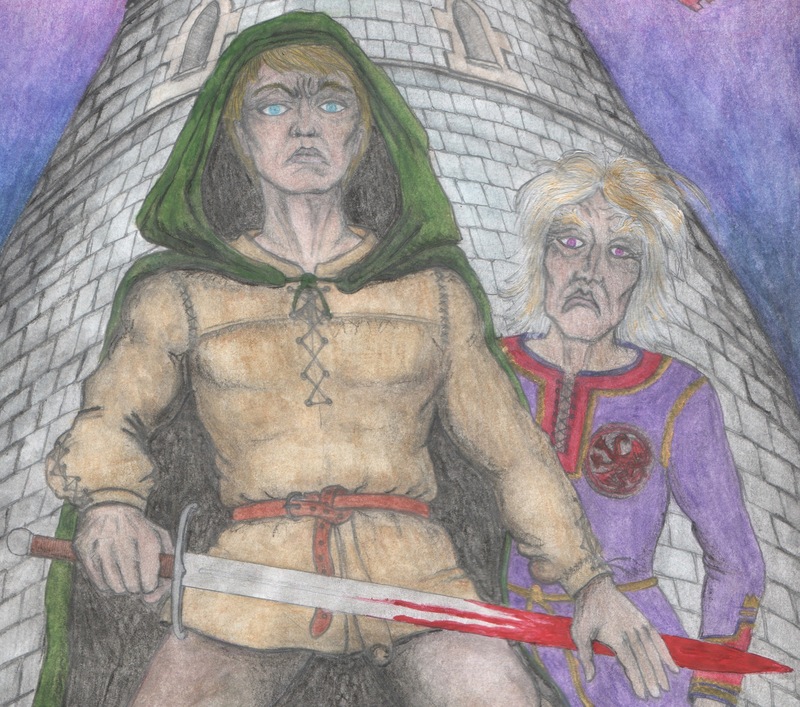 These pictures are part of a drawing series inspired by the A Song of Ice and Fire novel series by George R.R. Martin. The objective for this drawing series is to present each illustration accompanied by the relative quote from the books. To present characters and scenes as described in the books. The Novels are considered Canon, the HBO show, though being amazing, is not object of interest for this drawing series. Ser Barristan Selmy of the Kingsguard saves King Aerys II escaping from the Dun Fort. by Winter Design is licensed under a Creative Commons Attribution-NonCommercial-NoDerivatives 4.0 International License. Permissions beyond the scope of this license may be available at http://www.winterdesign.it/.